What says Viking more than horns? 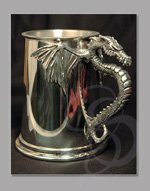 This impressive pewter tankard is the ultimate in Norse drinkware. If you were a Viking, would you hold your mug by a metal, handle? Of course not you southland ninny! You'd use a hunk of bone that you ripped off the head of some aggressive animal that you pillaged from a burning village. Or was that a dream I had? Reality seems to be slipping on me a little these days. Anyway, this tankard features a weathered/antiqued simulated bone handle, fixed onto the tankard with gilded pewter mounts. The face of the mug is uncarved, making it ideal for custom engraving, should you decide that you want to engrave "Ulfberht" or some other Viking name upon it. The mug holds a pint of fluid (read: alcohol) and is about as flashy a mug as a Viking could want. 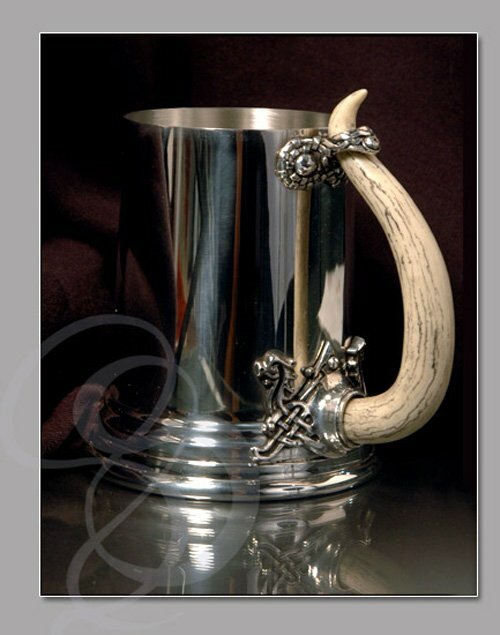 tankard with simulated horn fertility handle in traditional viking style, carved pewter mounts.